The global market for industrial motors was worth $32.9 billion in 2017 and is estimated to grow at a CAGR of 3.63% during 2018-2023.Industrial motors market by voltage is classified into very low voltage, high voltage, medium voltage and low voltage. Medium voltage motors generated a revenue of $6.7 billion and is projected to rise with a CAGR of 4.3%. 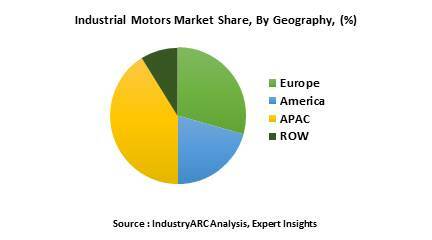 It is expected that Asia – Pacific will have the largest market for industrial motors during the forecast period. However, factors such as increasing electricity prices, advancement in energy efficient motors, industrial expansions will play a major role in the growth of the market. Industrial motors are widely used in industrial fans, machine tools, household appliances and power tools. The motors are powered by direct current (DC) or alternating current (AC) sources such as batteries, motor vehicles or rectifiers, power grid, inverters or generators. Motors with highly standardized characteristics are used in industries as they provide convenient mechanical power. These motors have longer life and less maintenance and are widely used for ship propulsion, pipeline compression and pumped-storage applications as they have longer life and less maintenance. What are the applications of Industrial Motors? Industrial motors have variety of applications in industries such as Oil and Gas, chemical, Power generation, metal processing, paper and pulp, food and beverage, textile, marine, agriculture, packaging and others. In most of the industries, the motor is used in drilling, working machinery, vehicles, conveyers, mills and crushers, fans and compressors, separations and beneficial equipment. In addition, motors are used in diagnostic equipment, centrifuge pumps, insulin and medicine pump, hospital beds and electric wheelchair. The prevalent trend in motors of different kinds is increased performance and specialization, efficiency, power density and torque density. There is an increasing call for specialized motors for specific applications. Most of the companies are developing specialized motors in order to optimize the design and manufacturing of the end users. Schaeffler Group has produced a number of electric motors mostly for industrial applications such as machine tools. In the recent days, they have developed a four wheeled bicycle that has an electric motor that can propel the bicycle or the rider can pedal it. Thus the increasing trend of the use of electric vehicles has raised the use of motors in the automobile industry. The recent trends of disposable medical devices, new consumer products, and the automation of humbler tasks are the prime factor behind the increased demand for affordable and miniature motor options. This compact design is gaining demand in hand tool application. The use of servo motors and direct drive motors in automated guided vehicles and e- mobility applications has been widely used. Various government norms have been introduced regarding reduction of CO2 emissions. US Department of Energy is investing heavily on the development of superior solar powered products. This has led to shift focus towards use of solar powered consumer goods as they have high efficiency and low power consumption. In the recent past, several end users have started to prefer service packages that ensure higher uptime of the rotating assets. The maintenance plan includes condition monitoring of assets, including remote assets, enabling predictive and preventive maintenance which facilitates planned maintenance and hence prevent the breakdown of machinery. Who are the Major Players in Singapore Professional Hair care market? The companies referred in the market research report includes ABB ltd, Siemens AG, Nidec Corp, Brook Crompton UK Ltd, Emerson Electric and others.